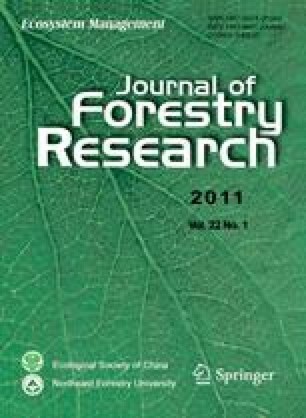 Improvement in seed and seedling quality of Acacia auriculiformis after culling phenotypically inferior trees was studied in a 6-year old seed production area (SPA). A 5-ha plantation was identified, of which 2.3 ha was converted into SPA. The initial stocking, 1 612 trees·ha−1, was thinned down to 982 trees·ha−1 based on growth characteristics. The following fruiting season, seeds were collected from 10 randomly selected trees in culled and non-culled stands, and seed physical characters, germination and seedling traits were assessed. Seed weight, seed thickness and percentage germination increased by 32.1%, 4.43% and 22.37%, respectively in the culled stand compared to the non-culled stand. Culling also increased the speed of germination, seedling dry weight and seedling vigor index. Heritability values were high for seed weight (0.974) and seed thickness (0.948) while medium values were observed for percentage germination (0.577) and total dry weight (0.534). Predicted genetic gain was 11.13% and 11.22% for seed weight and percentage germination, respectively. The actual gain was 32.1, 51.9 and 22.9% for seed weight, percentage germination and total dry matter, respectively. In conclusion, SPAs established by culling inferior trees could serve as sources of good quality seeds for reforestation programs until genetically improved seeds are made available.